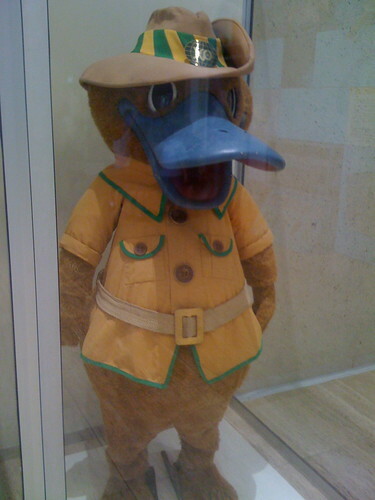 The Queensland Museum has been curating a display on Expo Oz, Expo 88's platypus mascot. 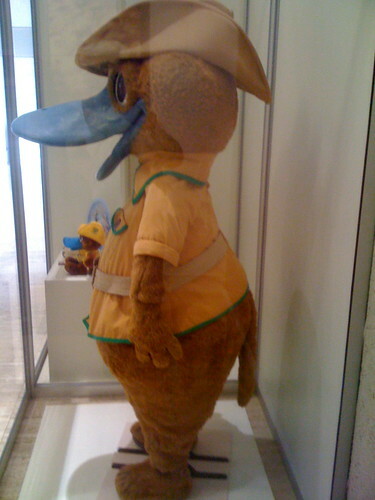 As a fursuit that had an important impact on Queensland's identity, I thought I should share it here. It was co-designed by a Disney animator and, we're told, bears a striking resemblance to Donald Duck. Same "Disney animator" design as Sam the Eagle from 84 Olympics... same eyes, same hat even! So we got fobbed off with a second hand design! Hmm, dunno about that. The eyes are generally similar, or even exactly the same, when designed by Disney. If you look at sam the Eagle, the general body design is the same, but the rest is quite different. Yes the hat, was, in the concept drawings the same, but it was then changed to be an Aussie slouch hat, like the ones the Diggers wore. Thus removing the more 'Americanised' top hat to an entirely Australian one. It is quite a classic look back to the 88 times. Pretty cool really. How tall is that suit? Um, taller than me including the hat (I'm about 175cm). But it looked me like the wearer would be a little shorter than me. It's hard to tell with all that padding and that hat.